April | 2012 | Keep It Up, David! Who Won the Giveaway? WAS IT YOU? 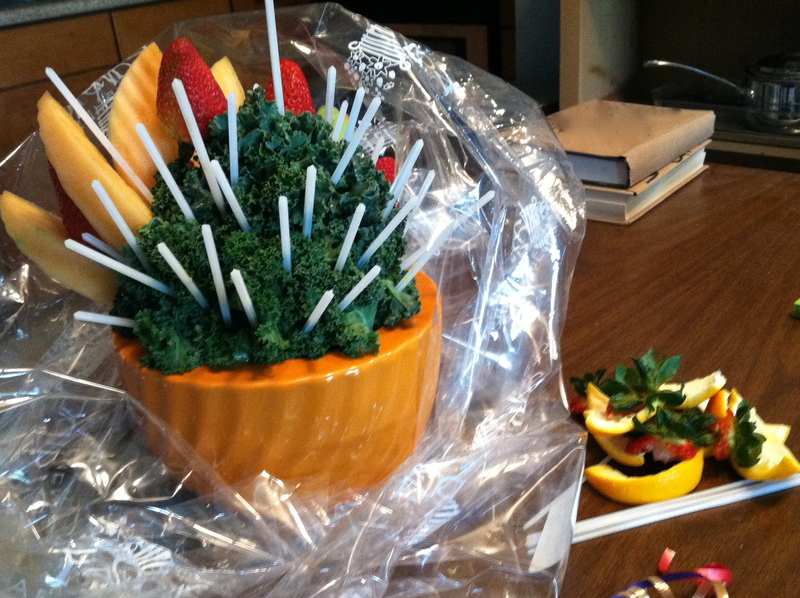 In total, there were 911 entries in my Edible Arrangements giveaway – NINE HUNDRED AND ELEVEN! That’s a lot of entries! That’s hundreds and hundreds more than I was ever expecting! I guess a lot of people really like Edible Arrangements, and I don’t blame them. I do too! So which one of those 911 blog comments is the winning one? I used random.org to pick a winner. 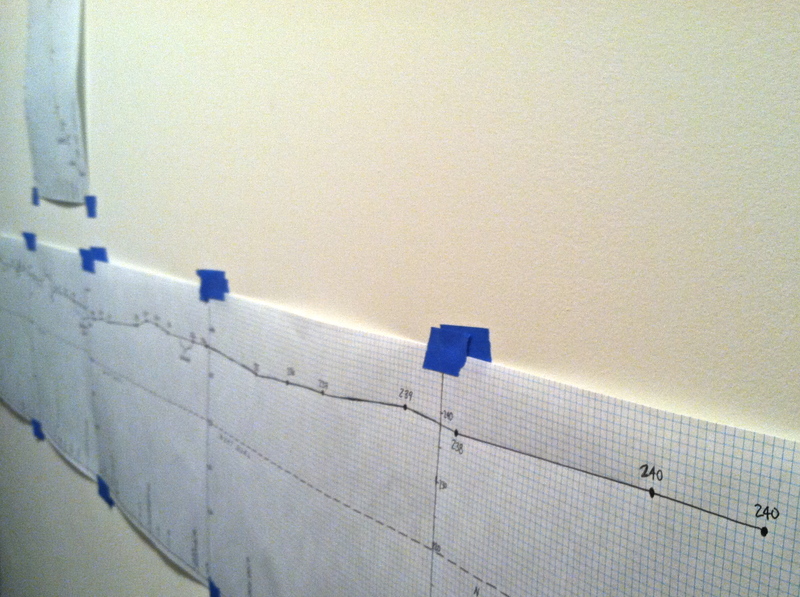 First, I plugged in the parameters: I wanted a random number between 1 and 911. 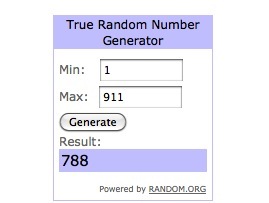 The 788th comment belonged to… RANDI MARIE SIMPSON! Let’s see Randi’s winning entry, shall we? Even though the rules said you could enter up to three times (provided you ‘liked’ and followed Edible Arrangements on Facebook and Twitter), Randi only entered once. And that was all she needed! LISTEN UP, RANDI! This post went live at 3am PST on Friday, April 27th, and you have 24 hours (until 3am PST on Saturday, April 28th) to send me an email at keepitupdavid@gmail.com to claim your prize. Remember how, when you left the comment, you had to provide an email address? You gotta email me from that address (which I can see but no one else can) so I know it’s you and not an imposter! I’ll reply to your email, confirming that it was received, and I’ll introduce you to the folks at Edible Arrangements, who will help you claim the prize. If I don’t get an email by 3am on Saturday, than I’m picking another number and someone else will win your fresh fruit bouquet from Edible Arrangements! And you don’t want that to happen! Congrats, Randi! I hope you enjoy the prize and I hope your mom likes it too! A big thanks to everyone that entered – I know that a lot of you were first-time visitors to Keep It Up, David, and I hope you stop by again! I got a lot to say, and I’m not afraid to say it! Quick reminder: You have until 11:59pm PST tonight to enter to win my awesome Edible Arrangements giveaway! ENTER HERE! More on that postcard later. My point is that the postcard and the Will & Grace episode got me thinking, and I couldn’t remember the last time I swam laps. I like to think that swimming is a regular activity in my workout arsenal, but it’s been over three months since I’ve been in a pool (I had to look that up – so thankful I make note of every workout!). A wonderfully tiring workout. The smell of chlorine on my skin as I write this brings me back to my competitive swimming days growing up. And I felt more aerodynamic (or hydrodynamic, I suppose?) in the pool than every before, thanks to my spiffy, pool-friendly haircut! For a lot of the workout, I was thinking about that postcard. 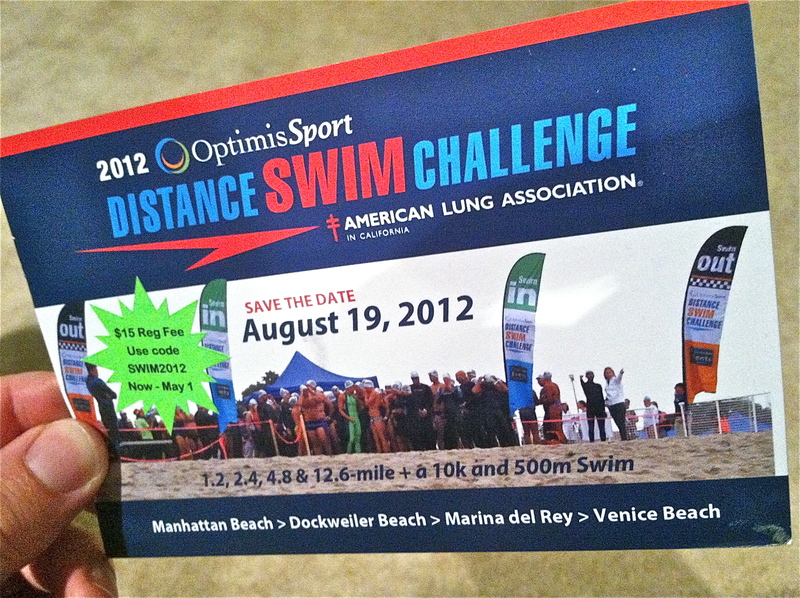 It’s promoting the American Lung Association’s Distance Swim Challenge in August – an open water swimming event in the Pacific Ocean. I’ve never swum for exercise in the ocean (I’ve only frolicked and gallivanted) and the idea is very intriguing. The ALA sponsored the skyscraper stair climb I completed a few weeks ago, and their events are well-organized and well-run, so that part doesn’t concern me. It’s the actual swimming. Open water swimming is quite different than pool swimming, and by ‘quite different’ I mean ‘much harder.’ Pools don’t have waves to contend with (sure, there are little ones made by other swimmers, but the lane lines break them up). Pools also have walls, so every 25 yards you can push off and gain momentum for the next length. Oceans lack both walls and lane lines, but they do have currents and waves, so addition to moving your arms and legs, you gotta pay attention, so you’re moving in the right direction (or risk swimming way off course or in giant circles). Plus, the lack of walls and the presence of currents (which may be working with or against you, depending on where you want to go) means it’s quite difficult to gauge how far you’ve swum (and how much remains), and that can really challenge your endurance, pacing, and stamina. Oh, and have I mentioned that oceans are salt water, whereas most pools aren’t? There’s also sharks. I’m not afraid of sharks, but the list of differences between pools and oceans would be incomplete without them. Yep. Open water swimming is a whole different beast than pool swimming. And I’m considering registering myself for this event. Right now I’m just considering it – I don’t think I’ll make a decision for another month or so. Right now I have my upcoming stair climb challenge to focus on (have you donated yet? It’s goes to a great cause! ), and then, after that, I have another fitness challenge already lined up at the end of May that I have yet to mention on this blog (one challenge at a time, folks!). So if I make a decision in early June, I’ll still have over two months to train and prepare. I’d also have to pick the distance. The event offers 1.2 mile, 2.4 mile, 4.8 mile, and 12 mile swims. My gut says go with the 1.2 mile, since it’s my first open water event. 1.2 miles is very doable for me in a pool. It’s 2,112 yards – that’s almost 700 yards less than I swam yesterday. But I have a feeling 1.2 miles in open water would feel a helluva lot different. So, I’m thinking about it. Have any of you done any ocean swimming, either as a stand-alone event or as part of a triathlon? How did it go? Meanwhile, I just calculated that yesterday’s swim was 112 lengths of the pool, which is a hair under 1.6 miles. 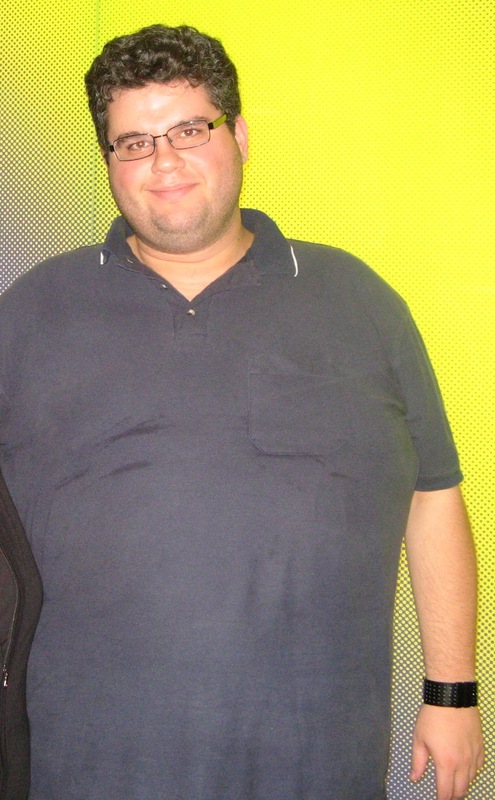 Weight Chart Update AND Underground “Before”/”Current” Photos! 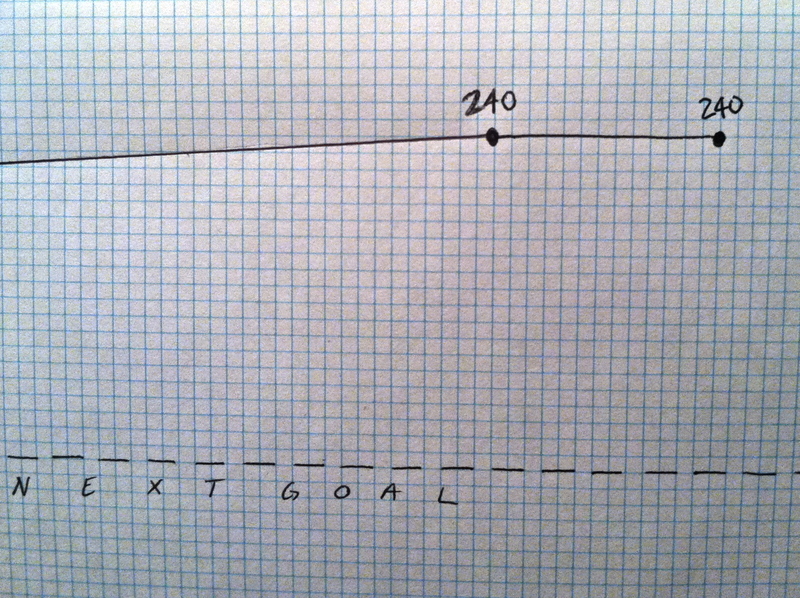 The last time I weighed myself, two weeks ago, I had to give myself a big ole pep talk. And I needed it. And it worked! The past two weeks have been full of good choices and healthy eating. But I also had a major body part conspiring against me: my foot. After injuring it last week, I spent the better part of three days plopped on my couch, icing and elevating it. I did make it to the gym for some upper body workouts, but I also ended up having a couple more rest days than I had planned. Maintaining my weight is a good thing. Nope, I’m wrong… it’s a GREAT thing. 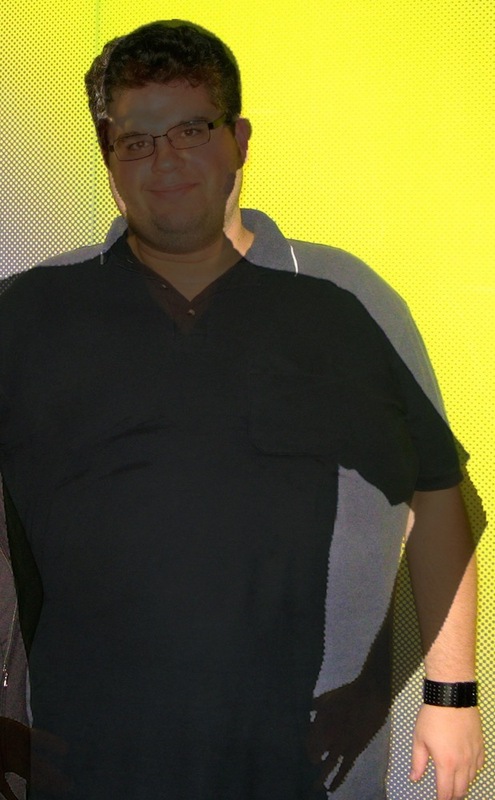 So, for everyone keeping score at home, maintaining my weight means I’ve still lost 162 pounds. And counting. I was downtown a few days ago, and some friends and I went to lunch. We headed over to 505 Flower, which is an office tower that has an big underground shopping center beneath it. The shopping center is mostly restaurants and eateries, and I had a fantastic salad at a place called Salata, a Texas chain that opened their first California location last year. As exciting as that salad was, what was more exciting was that it was my first time at 505 Flower in about three years, and I had the chance to update a “Before” picture! 505 Flower has these glowing yellow and blue walls near their escalators, and, truth be told, they’re kinda cool and kinda hideous at the same time. Three years ago, I got a picture with my friend Heather in front of the wall, and it’s a terrible photo. It was taken at 1am, and there’s nothing I like about it, and that what makes it a perfect ‘Before’ photo! You can see the version with Heather (and a more recent picture with Heather, who has lost 50 pounds, by clicking on Photo Gallery – there are lots of ‘Before’ and ‘Current’ photos there). A note to anyone who finds themselves at 505 Flower: as tempting as that glowing wall may seem, it’s a really tough background for a Kodak moment. 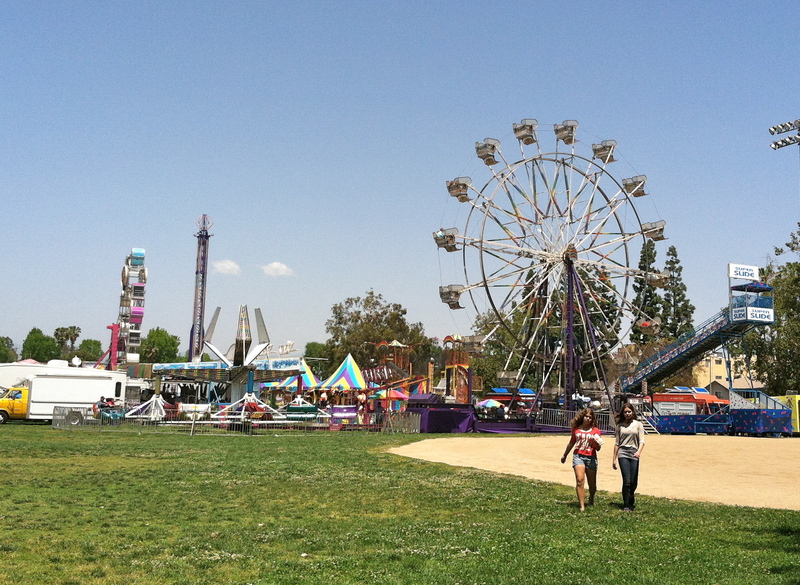 My friend Maya took the above picture, and she took about 15 just so I could have one that turned out semi-decently. 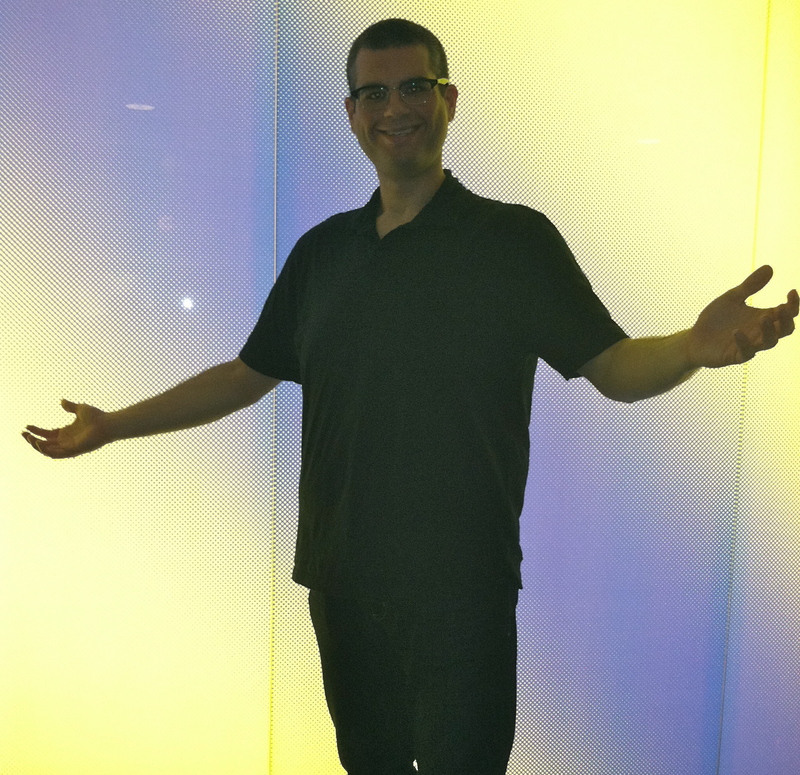 I have a hunch that not many people will look good in front of that shade of glowing yellow. But if you’re in downtown LA, I invite you to go and prove me wrong! 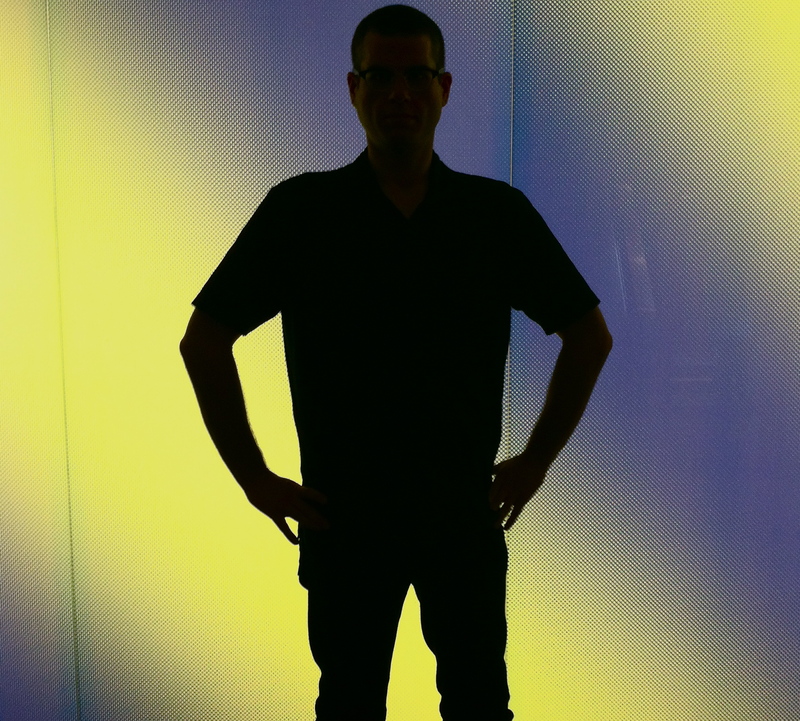 I actually LOVE another picture that Maya got of me – full silhouette! This picture makes me want to shout GO BLUE! – and if you’re a fellow University of Michigan alum or fan, than you’ll know why. 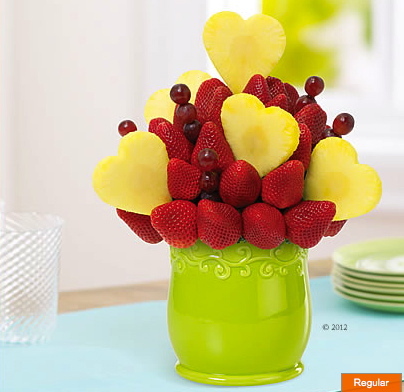 PS: Tomorrow’s the deadline to enter my giveaway to win a $68 fresh fruit bouquet from Edible Arrangements. Have you entered yet? I like to bring home new things that I find in the produce aisle and experiment in my kitchen, and this post is about an unsuccessful experiment. They can’t all yield gold. Sometimes they yield… um… mud. Brackish swamp water? coal? Not quite sure how to finish that analogy. Giveaway. Have you entered my Edible Arrangements giveaway yet? Tsk tsk if you haven’t! I’m giving away $68 of fruit (!) to one lucky winner, and you can’t win if you don’t enter! Click here for the details. 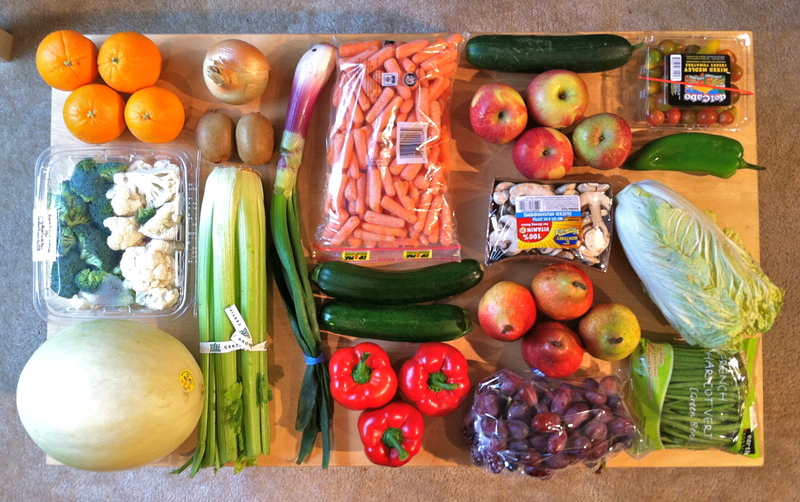 From left-to-right and down each column, we have: 4 navel oranges, pre-cut broccoli and cauliflower, a honeydew, a sweet onion, 2 kiwis, a head of celery, a red spring onion (more on this guy later), baby carrots, 2 zucchini, 3 red peppers, 1 cucumber, 4 Rainier apples, 1 package mushrooms, 4 red bartlett pears, 1 bag red grapes, 1 package baby heirloom tomatoes, 1 Anaheim pepper, 1 head napa cabbage, and pre-trimmed green beans. Lots of healthy options is always a good thing! Foot. It’s been about a week since I mysteriously injured my left foot, and I’m happy to announce that it’s felt wonderful for about 4 days now. 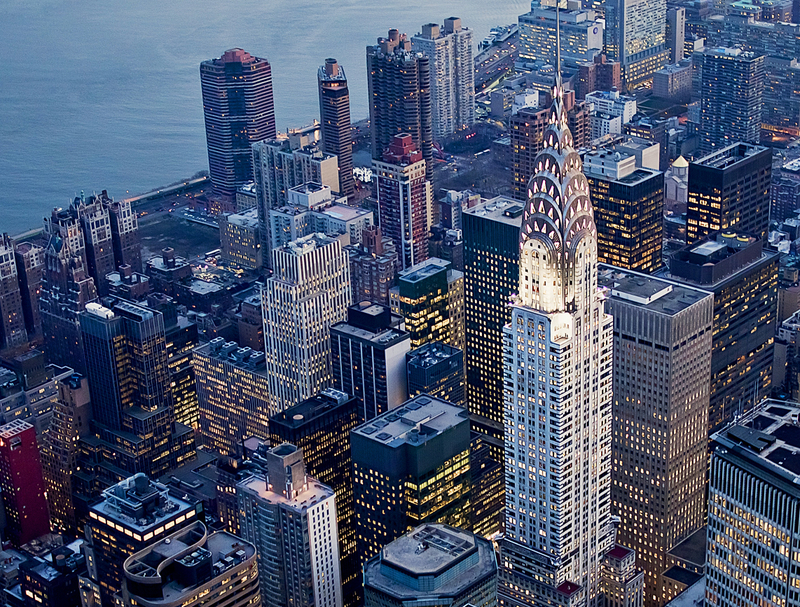 Postponing my big 163-story stair climb challenge was the right thing to do (now I’m doing it on 5/5/12 – donate here! ), because I’m going to take the time to make sure it’s all healed and I’m fully prepared instead of rushing into anything. That said, after taking it easy for the past week, I’ve been jonesing for some StairMaster. Because I didn’t want to aggravate my injury if it wasn’t fully healed, I decided yesterday to give the StairMaster a try, but with some parameters: I wouldn’t go for over 10 minutes, and I wouldn’t exceed 60 steps per minute, which is my warm-up speed. I stuck to my rules, and after those 10 minutes, I was feeling the burn in my legs. I’m eager to get full-force back into my stair-climb training, but I know I gotta work my way up. Ten minutes on the StairMaster was a good start. In those 10 minutes, I climbed 37 stories, which means it’s time to add a new building to my Skyscraper Collection! 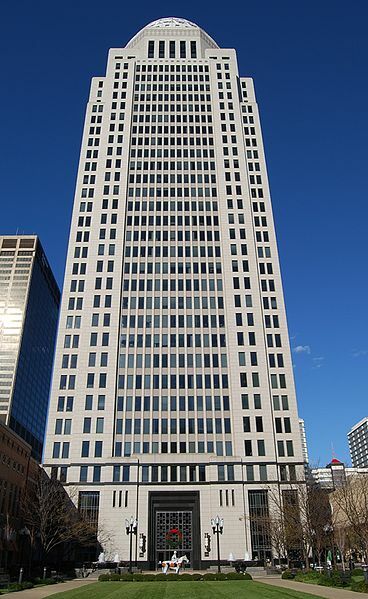 Meet the AEGON Center, the tallest building in Kentucky. This Louisville skyscraper is 35 stories, and it’s the first building in my collection that is topped with a dome (it’s 80 feet high). You can’t see it that well in the picture, but out front of the AEGON Center is a statue of Alysheba, a well-known racehorse that won the Kentucky Derby in 1987. He’s also quite the stud: he fathered eleven other champion racehorses. I’d say Keep It Up to Alysheba, but he passed in 2009. FIDDLEHEAD FAIL. 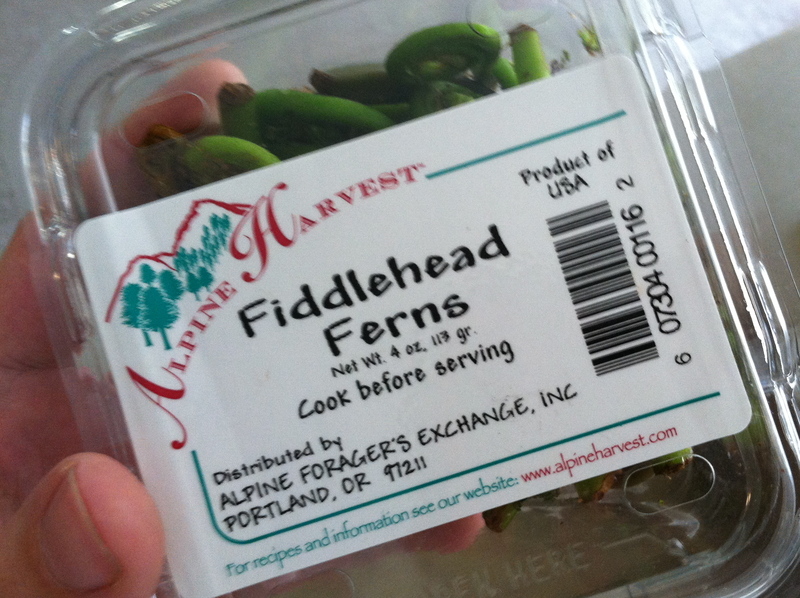 I was ecstatic last week when I saw, at the store, fiddlehead ferns. 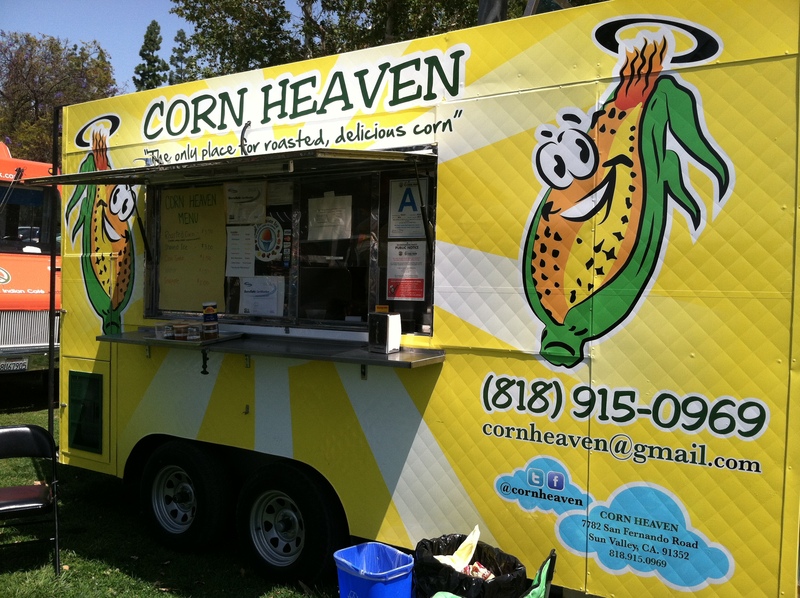 I don’t think I’ve seen them since I was in college, but I was a poor college kid back then, and much less inclined to spend money on food items I’ve never tried before. I think fiddlehead ferns are one of the coolest-looking things I’ve ever seen in a supermarket (right up there with dragon fruit and romanesco broccoli). 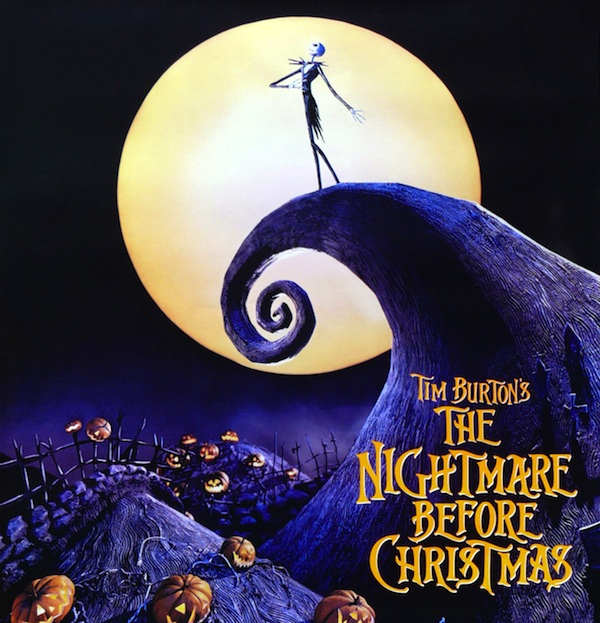 I’m reminded of the poster for the 1993 movie “The Nightmare Before Christmas.” Maybe Jack Skellington is actually walking on a giant fiddlehead fern? Fiddlehead ferns are quite literally curled up baby fern fronds. Once they grow bigger and unfurl, they’re no longer edible, so these are harvested out in the woods (they’re not farmed) for a few weeks each spring. Fiddlehead doesn’t refer to an actual species of fern, it refers to the shape of them, since they look like the top of a string instrument. Fiddlehead ferns can actually be any number of different fern species, and in the US, they’re mostly Bracken, Ostrich, or Cinnamon ferns, which grow throughout the northeast and northwest. 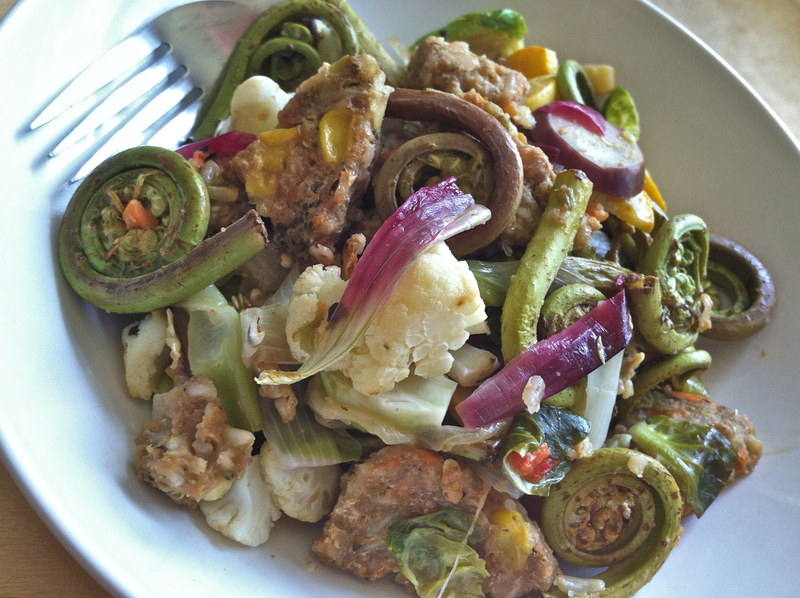 Fiddleheads are good sources of potassium, fiber, antioxidants, and Omega-3 and Omega-6 fatty acids. On the flip side, there is evidence that they may contain trace amounts of carcinogenics, so I wouldn’t make them a staple of your diet. 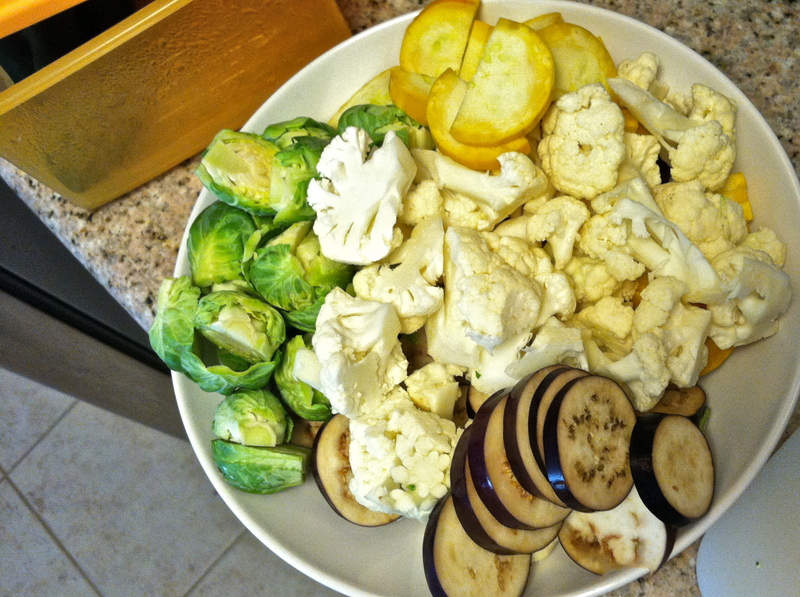 That’s cauliflower, baby eggplant, brussel sprouts, and yellow zucchini. 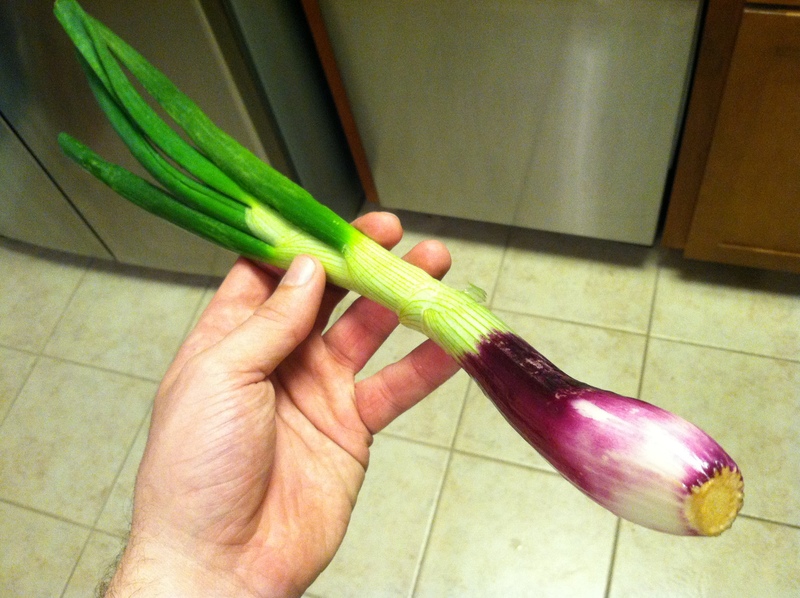 I also added in a second new-to-me vegetable: a red spring onion. I saw these at the store a few minutes after finding the fiddleheads, and one immediately ended up in my cart. They’re pretty. Even though I hadn’t bought one before, I was familiar with them – I think because I saw them on the Food Network or something. 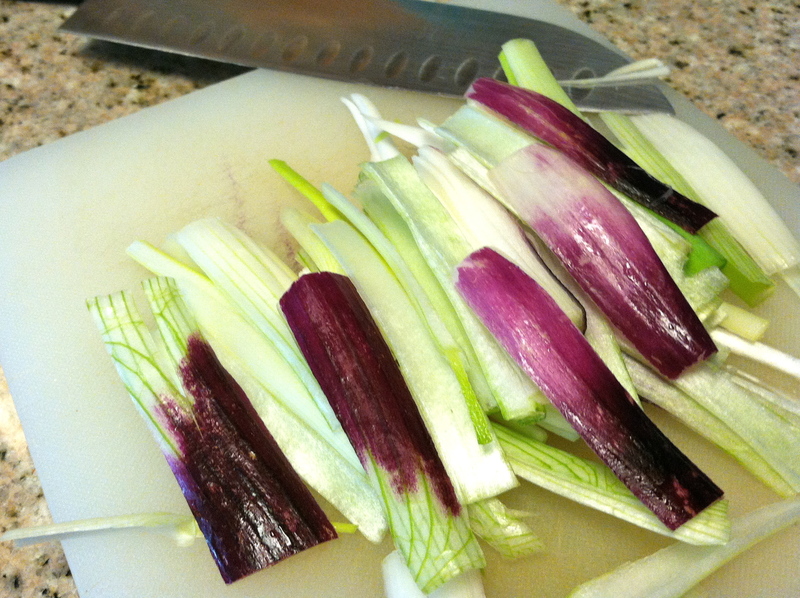 Basically, you cut off the dark green tops, and use the rest in any way you would use scallions. I chopped it into matchsticks (and was a little bummed it was only red on the outermost layer). The fiddleheads went into the skillet (which I had coated with non-stick spray) first – I had read that they needed a good long 12-15 minutes to cook. Soon, I added the rest of the veggies. 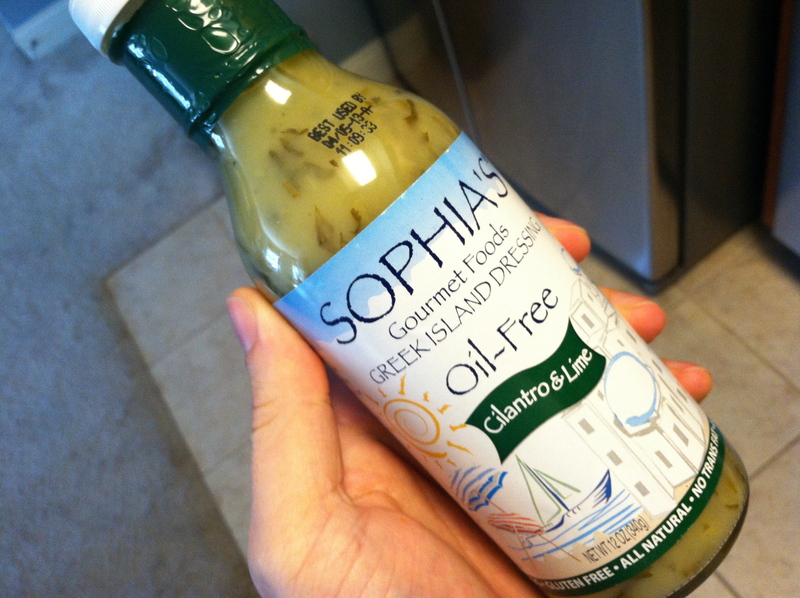 For a sauce, I cracked open a bottle of cilantro and lime dressing that I had in my cupboard. I like both cilantro and lime, and had read that citrus goes well with fiddleheads, so it seemed like a good fit. 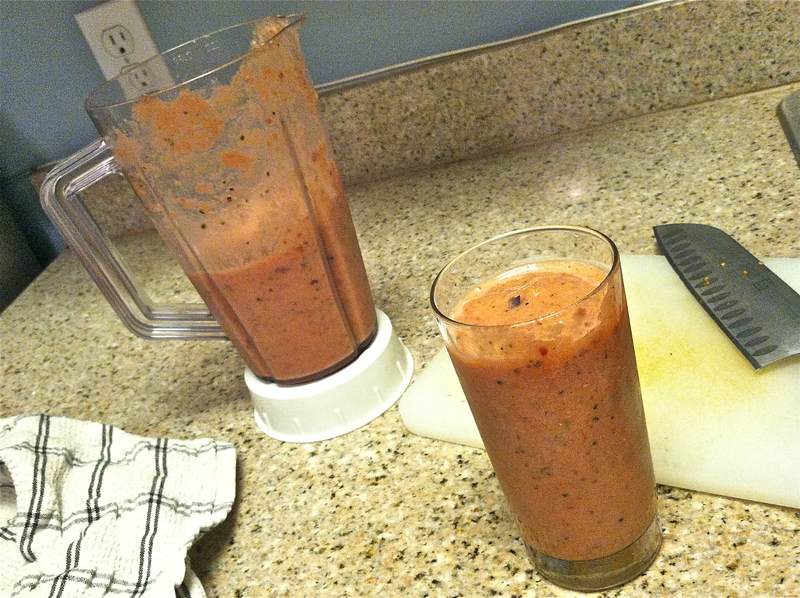 Plus, it’s oil-free, fat-free, and is only 5 calories a tablespoon – so I added about a quarter-cup. For protein, I chopped up two veggie burger patties and added them in to the skillet. It was a lot of food – good for two meals, at least. 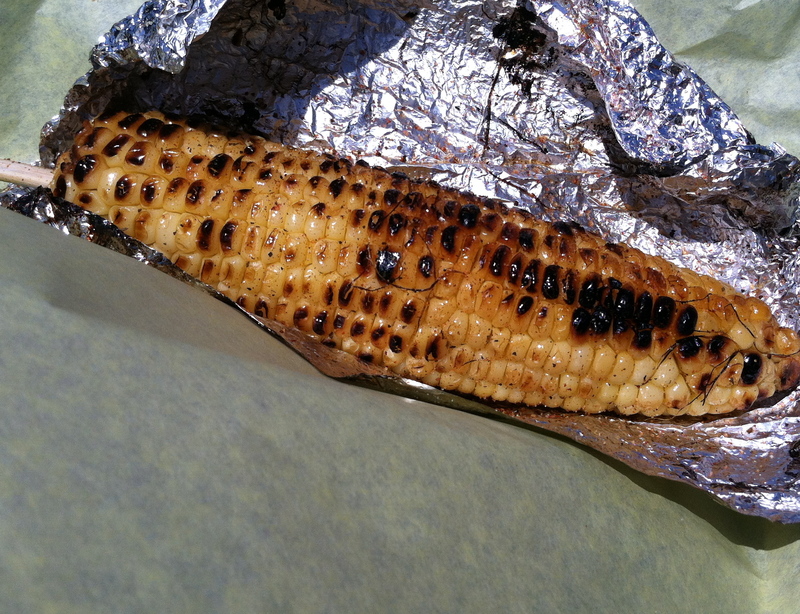 Fifteen minutes after the fiddleheads first hit the heat, I had a finished meal. The fiddleheads were bitter little buggers – they had the bite and the texture of asparagus, but bitter. The dressing I used as sauce was extraordinarily acidic and sour (it has listed among the ingredients lime juice, lemon juice, and vinegar – so that’s why). Bitter + Sour = not very good. 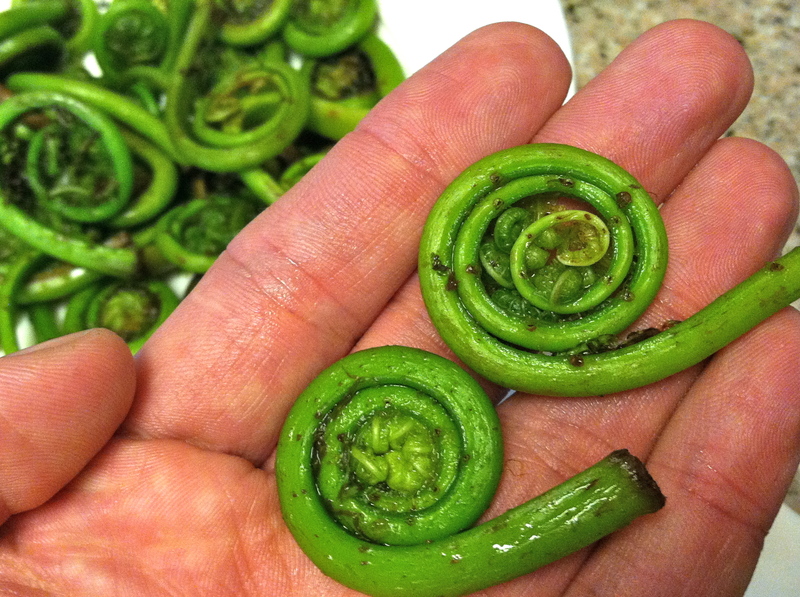 I’m curious if any of you have had experience with fiddlehead ferns, and if so, what worked for you? Any tips or tricks? I’m not one to give up after a single attempt (although given the fiddleheads’ short harvesting season, I may not get another attempt until next spring). I’ve already looked at a bunch of fiddlehead recipes, a lot of which call for steaming or boiling them, so maybe I’ll try one of those next time. Even though this attempt wasn’t nearly as successful as previous ones, I’m proud that I give new things a whirl, and look forward to my next produce aisle find! Wanna Win Some Fruit? Enter My Edible Arrangements Giveaway! By the next day, I had eaten the rest of the fruit, and it was deeeeelicious (the orange bowl, by the way, found a new home on my end table). And my tweets caught the attention of the folks at Edible Arrangements, who tweeted back, saying they enjoyed the pictures I shared, and that they had checked out my blog. Awesome! Next thing I know, an email from them arrived with an offer to sponsor a giveaway on my site! How cool is that?!? Before I get into the details, I just wanted to welcome anyone that’s visiting Keep It Up, David for the first time. Thank you for stopping by! I invite you to take a look around. I blog about health and weight loss (I’ve lost over 160 pounds and counting), and share what I’m eating, how I’m exercising, and all my struggles and successes. You can see lots of ‘Before’ and ‘Current’ photos in the Photo Gallery, read about my history with weight on the My Story So Far page, watch my appearance on “The Ellen DeGeneres Show,” and check out some of My Favorite Posts. If you like what you see, consider following me on Facebook or Twitter (they’re great ways to learn about new blog posts), or you can get new posts via email by hitting the “Sign Me Up” button that’s below the head-to-toe shot of me on the right. Let’s get into the giveaway details, shall we? I’m giving away a brand-new fresh fruit bouquet from Edible Arrangements that’s not even available for sale yet! It’s their Blooming Hearts bouquet, which has pineapple, strawberries and grapes, all arranged in a keepsake green ceramic container. Check out the arrangement on Edible Arrangement’s website. Retail price: $68. For the winner of this giveaway: FREE! Mother’s Day is coming up… How great would it be to give mom something healthy this year? Plus, fruit is so much tastier than flowers. Just sayin’. Here’s How to Enter – It’s Simple! 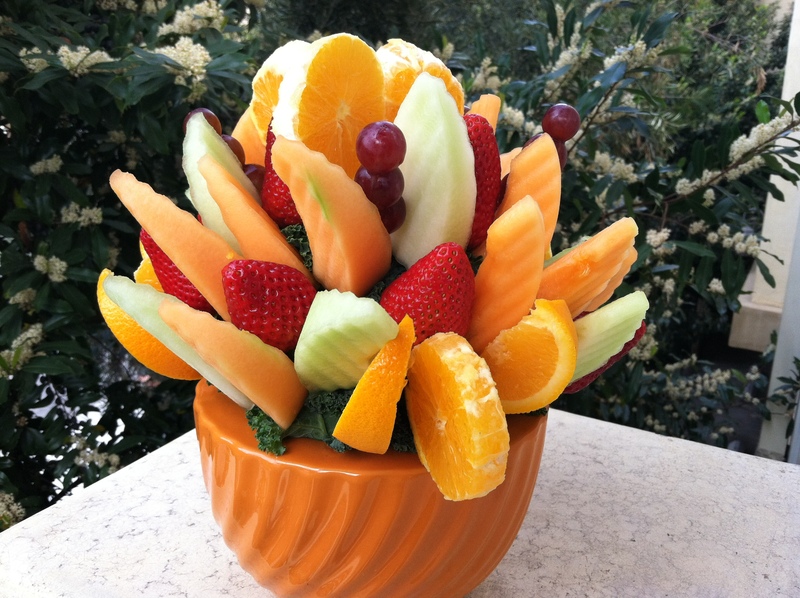 Leave a comment in the comment section below, saying who you’d share this fresh fruit bouquet from Edible Arrangements with and why (it’s perfectly all right if you don’t want to share it with anyone – I didn’t share mine!). That’s one entry. If you click here and “like” Edible Arrangements on Facebook, you can come back and leave a second comment, which enters you a second time. If you click here and follow Edible Arrangements on Twitter, you can leave a third comment, which enters you a third time. That’s it – three entries per person! And the entries must be comments on this post – entries made via Facebook comment, tweet, email, singing telegram or smoke signal will be tossed out like yesterday’s pineapple rinds. 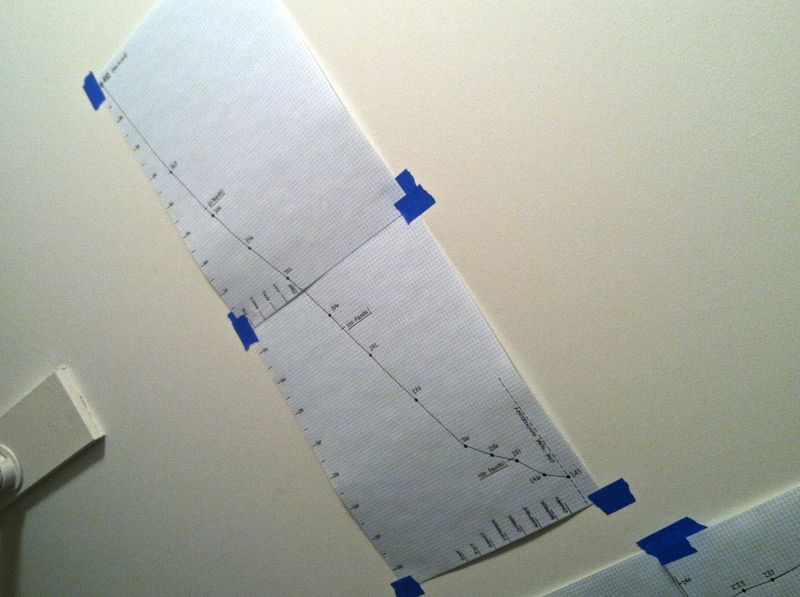 Deadline for Entries: 11:59pm PST on Thursday, April 26, 2012. I’ll announce the winner on Friday, April 27, 2012. 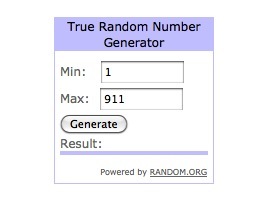 I’ll use the random number generator at http://www.random.org to pick a winning blog comment, and the winner will have 24 hours to email me at keepitupdavid@gmail.com to claim their prize. If it goes unclaimed after 24 hours, I’ll pick another winner and reset the clock for 24 hours, and so on. Once the winner has emailed me, I will put them in touch with the fine folks at Edible Arrangements, who will help arrange the prize. Product giveaway is for pick-up only at one of Edible Arrangements’ continental US locations. Order can only be placed by calling the national call center at 877-363-7848. Not valid at international stores or on shipped products. Order must be redeemed or picked up between between 4/30/12 and 5/7/12. Not valid with any other offer, coupon or promotion and cannot by applied to past orders. EDIBLE ARRANGEMENT®, the fruit basket design logo, and other marks mentioned herein are registered trademarks of Edible Arrangement, LLC. © Edible Arrangement, LLC. All rights reserved. What are you waiting for? You can’t win if you don’t enter! You are currently browsing the Keep It Up, David! 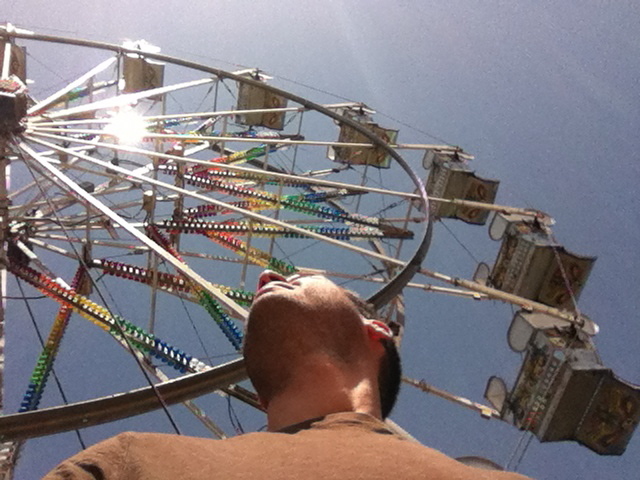 blog archives for April, 2012.